One size fits most, 5'4" - 6'4"
Inflatables are one of the hottest trends in the costume industry, and we have another zany creation in this Inflatable Presidential Adult Pick Me Up Costume. 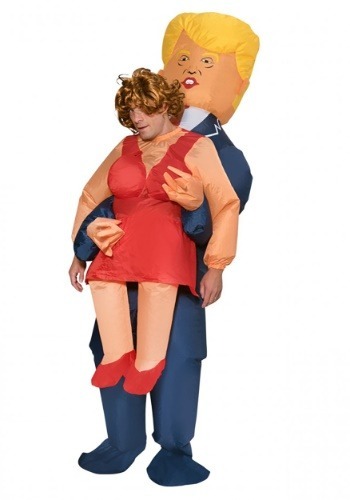 This costume creates the illusion of you being held up, with an oversized head that sits behind yours to help create the costume illusion. You can add a wig for extra effect just like we have it pictured. This costume comes from famed fun company Morphsuits. It comes with a polyester inflatable suit that's enclosed with openings for the head and hands, and it's designed to fit most people from 5'4" to 6'4". It comes with an integrated fan and a battery pack that clips to belt or waistband or fits in your pocket. Batteries are not included.